Do you want and need more traffic to your website, blog or store? Would you like traffic from Social Media sites driven to your website? Then you need our 50,000,000 Social Media Marketing and 500,000 Website Traffic Explosion service! We will promote your site to 50,000,000+ people on Social Media and send 500,000 website traffic visitors to your site from social media for 6 months or more. Exploding your site with life giving visitors! We will promote your website to an audience of 50,000,000 people. And send a minimum of 500,000 website visitors over 6 months time. We've been doing SEO and SMM for a long time (15+ years). So you're in good hands! In that time we have built up a massive resource pool made up of old and aged pages and profiles, big groups and communities and more where we (as affiliate marketers) promoted our own sites on. In the last 5+ years we've been using it to promote other people's (our clients sites). And that resource pool has got bigger all the time! We are now members and owners of many aged and old social media pages and profiles, and more big groups and communities on the biggest social media sites than ever before. And we will post, submit and share your website, blog, videos, products etc or anything to all them for you. 50,000,000+ People Worth Advertising to! When you add up all of the users and followers in all of the pages, profiles, groups and communities and sites that we post your site on it can come to over 50,000,000 (50 million) people. Biggest Social Media site Group SharingWe post to the biggest Social Media site's groups made up of millions of followers collectively. If you add up all of the users in all of the group's it comes to over 50,000,000+ people collectively! Biggest Google Plus Community SharingWe post to the biggest Google Plus communities in your niche with thousands to millions of users in them. We actively search for and post to Google+ communities in YOUR niche. That way you get super niche targeted traffic from people who have an interest in your site and or whatever it offers and sells. Big Twitter Account TweetsWe will Tweet your message/links/#hashtags etc to 20+ Big and old Twitter accounts. These all have many thousands of followers some from 50k to 500k. Plus you'll get tons of likes and retweets on most of them for adding more authority and power to your Tweets which will only go on to send more traffic on time too. Pinterest Group Board Pin PromotionWe are owners and collaborators of some of Pinterest's biggest Community Group Boards today that have many millions of followers in them collectively. 3K+ Mixed Social SignalsNot that you won't get over 250+ Social Signals from all of your posts since each one counts as a signal. But we'll also build 3000+ more signals to your URL also. Made up of web likes and shares, pins repins tweets retweets etc. These signals go hand in hand with the SMM we do. Top 25+ Social BookmarksAs well as posting to the biggest groups for you, we'll also build 25 Top Social Bookmarks to the biggest bookmarking sites like Reddit SU etc etc. 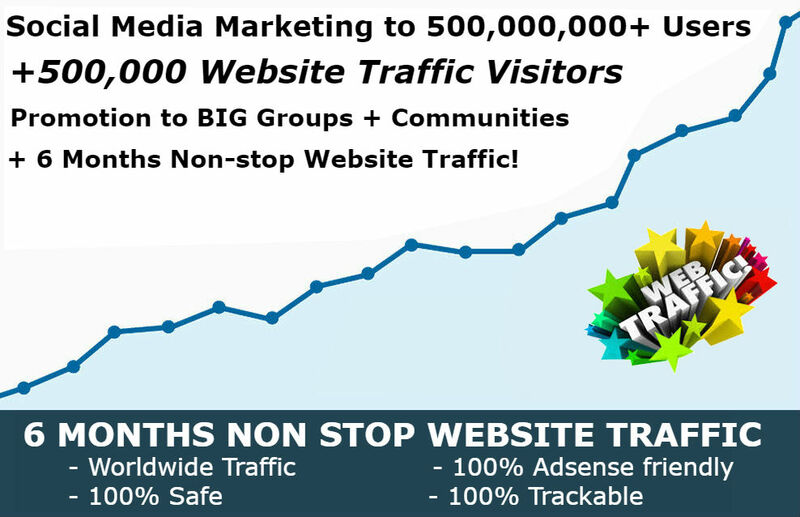 500K Website Traffic VisitorsAs well as doing all of the above work for you which gives you a wide blanket coverage of social media marketing promotion which can send tons of traffic back to your site, and go on to have a long lasting benefit too, we will also send 50,000 Social Media website visitors yo your site too! In a nutshell, we do a lot of Social Media Marketing and Promotion for your website where there are many people and in places that are related to your site and business. To help you build and grow your business, get exposure and rank up! And you can't buy this much social media promotion and marketing and this much website traffic for this long for less than this today. Plus this is only an introductory price and the price will go up in time so get in now if you want to get this at the current low price! I've been providing SMM services on SEOClerks for 5+ years and only do high quality SMM work. I have many positive recommendations and ratings for my service quality and skills so you're in good hands! We only do relevant, high quality, white hat SEO/SMM for your website and it can be considered high quality Social Media marketing and promotion that can only have a positive benefit and effect on your website. We only use proven reliable website traffic providers and methods for your website traffic that we use our self. You will get direct social media referral traffic from a mix of the top 10 sites. 500k spread out over 6 month time. Big Social Media Group Posting with 500K mixed Social Media Traffic for 6 months. How Long Does it Take to Complete the Group Posts ETC? From ordering we will complete all of your posts within a few days time. Your posts will be spread out over A few days or so but we can post all in 1 day with Quick Delivery. NOTE: We can't do quick delivery if you order a lot of extras obviously! Your traffic will be spread out over 6 months time. At minimum the website URL you want to promote. You can use 2 URLs, 1 for the SMM and 1 for the traffic or 1 for both. Give us your promo message and maybe a couple #hashtags maybe when ordering. Else we can create a short n sweet promotional copy message for you. How Much Traffic Will I Get from the SMM Work? We have no control over what people like and do on Social Media so cannot guarantee anything other than to do the advertised work here for you. We don't know what your niche is and there's so many other factors to take into consideration. But this is SMM promotion and SMM works else people wouldn't do it! How Much Traffic Will I Get and for How Long? You will get at least 500k minimum from the traffic we send or more depending on whether you order extra amounts or not. Plus whatever traffic you get from your SMM work too. Your traffic will be spread out over 6 months time for you at around 500-5000 per day. How Many URLs Can I Use for the Traffic? You can use 1 URL per 500k visitors. We can send across more URLs for you with one or more of our Extras below. If you order the extra Send 5,000,000 Total Visitors then you can use 10 URLs total for example. Is The Traffic Safe / Reliable? Yes we only use tried, tested, highly rated/trusted approved traffic providers and use a network that was set up to help webmasters get website traffic and is from a network made up of thousands of different websites and portals from around the world and is confirmed 100% Adsense safe. What's The Guarantee / Is There A Refund Policy? Your statutory rights are not effected and there is a guarantee in place for your satisfaction if we fail to provide proof of your work as advertised. However we wouldn't deliver unless the service was completed as advertised anyway. This is an SMM advertising service and so we only guarantee to do the work that's advertised here for you. If we fail to do that for you when delivering you can ask for a full refund no questions asked. Do I Get A Work Report When Completed? Yes! We will keep all of your live post URLs and deliver them all to you in a report when completed so you can see and check on all of the work that was done for you. Order now and get all this promotion and 6 months of traffic for only $49. Hey reader! Are you new to SEOClerks? Don't have an account yet? Sign up through me and get 20% off this service and ALL of my services! Plus get discount codes, freebies and more! Also learn how to be successful on SEOClerks as a seller and buyer. 50,000,000 Social Media Marketing and 500,000 Website Traffic Explosion service is ranked 5 out of 5. Based on 20 user reviews.